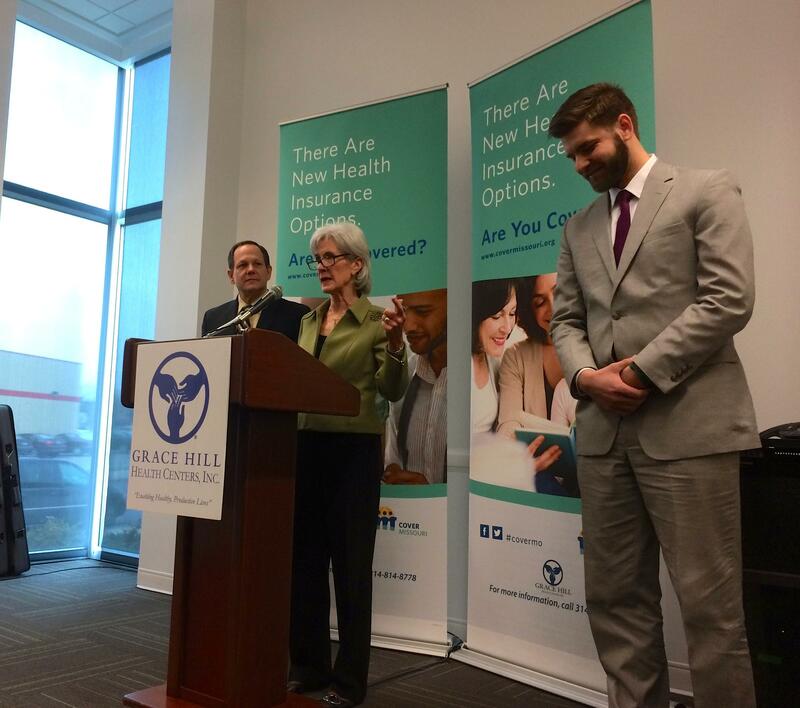 U.S. Health and Human Services Secretary Kathleen Sebelius tried to put a price tag and a face on the government’s health reform push in Missouri when she visited the Grace Hill Water Tower Health Center on Friday. Secretary of Health and Human Services Kathleen Sebelius holds a press conference with St. Louis Mayor Francis Slay in north St. Louis. Law student Nathaniel Carroll spoke about the benefit of having health insurance. The price tag: $5 million a day. That’s how much she says Missouri is losing by refusing to expand its Medicaid program under the Affordable Care Act. The face: a local resident who praised the law for the help it is providing his family while he attends law school. Following comments by St. Louis Mayor Francis Slay, Sebelius introduced Nathaniel Carroll to share his positive experience in getting insurance through the healthcare exchange. The 28-year-old father of two is a third year law student at Saint Louis University. He told the press conference that health reform had been a lifeline for his family. In the middle of his presentation, Carroll mentioned trying to sign up on the web and “it didn’t work,” a comment that prompted a little laughter. He quickly said the delay “was not her (Sebelius’) fault.” He eventually succeeded in signing up for a family plan costing $43 a month. He says he is realizing a $400 savings through premium tax credits and pays a $1,000 deductible a year. “A lot of people work hard and get paid a lot less in this state, and we need to provide coverage for them,” he said. The testimonial by a middle class male breadwinner indicates the government is conscious of the fact that many Americans tend to associate the problem with mostly poor people. But the law offers benefits to families earning up to 400 percent of poverty – more than $90,000 for a family of four. One key aspect of the Affordable Care Act is expansion of Medicaid, the health care program for the poor, elderly and disabled. A U.S. Supreme Court case made the expansion contingent on state approval, but the Missouri General Assembly balked at such a move. Sebelius called the federal match “an incredible generous offer.” Under the current arrangement, the federal government pays for the first three years of expansion if a state boosts Medicaid eligibility for adults who earn at least 133 percent of the federal poverty level. It gradually goes down to a 90-10 match over time. Because Missouri hasn't expanded its Medicaid eligibility, the federal government is not providing the state matching Medicaid dollars. As a result, Sebelius said, Missouri is losing $5 million and is hurting the 16 percent of its residents who are uninsured. That figure includes 227,000 people in the St. Louis area. 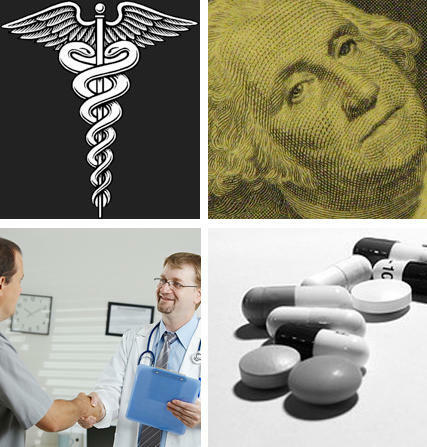 During last year’s legislative session, state Rep. Jay Barnes, R-Jefferson City, put forward “market-based Medicaid” proposal, that had a host of alterations to the program. One key stipulation: The state would only raise Medicaid eligibility for adults up to 100 percent of the federal poverty level. Barnes has said this was one way to push the Department of Health and Human Services to grant a waiver to the state. “Either the federal government allows red states to craft solutions that work for them or we don’t do it,” he said last year. Barnes hasn’t introduced Medicaid legislation this year, but last year's proposal has been seen as a potential template to move the issue forward. He talked about the issue at length in his recent appearance on the "Politically Speaking" podcast. Without legislative action, she said, Missourians “will be totally without any financial support for health insurance.” She also contended the state would lose money. Barnes said he had no reaction to Sebelius' statement. Health and Human Services Secretary Kathleen Sebelius answers whether her agency would grant a waiver to a Medicaid expansion that doesn't go up to 133 percent of the federal poverty level. She added that premiums under the health reform law would cost as little as $32 a month for a family earning $50,000 a year, and about $76 a month for a 27-year-old. “You can’t find a cable plan or a cell phone plan that will give you that peace of mind and security,” she said. Mayor Slay said the region was about to make a strong effort to inform small businesses of the value of the health reform law. He said the effort would target restaurant, hotel, and grocery store owners to spread the word that health insurance is available for their workers, and that the deadline for signing up is March 31. Starting on October 1, Missourians will be able to shop for health insurance through a new online marketplace. It’s one of the biggest changes in health insurance coverage under the federal Affordable Care Act. But there’s still a lot of confusion about how the exchanges will work. St. Louis Public Radio's Véronique LaCapra spoke with the Missouri Foundation for Health’s Ryan Barker to try to get some answers. How will Missourians access the new health insurance options?